Feb. 7, 2014. While epitomizing the classic diners of the ‘50s with neon lights and retro memorabilia on the walls, Troy’s 105 Diner serves anything but your run-of-the-mill diner food. No. It serves “fresh, comfort food,” said Troy and Sandy Bryum, who bought Mel’s Diner in 2005 and immediately revamped the line of ingredients while maintaining the décor. Troy’s 105 Diner uses real mash potatoes – not a box of dry powder, and steaks are cut onsite. Also made from scratch are Troy’s specialties: soups, chilies, stews and casseroles. And just as the greens are cut each morning, so to are hamburger patties prepared by hand everyday. The meatloaf is handmade, and the chicken wings are fresh. “We don’t buy anything frozen,” Troy said. The Byrum’s met in the mid ‘80s when both were employees of the Everglades Club in Palm Beach, Fla. They first came to the High Country in 1986, when Executive Chef John Hofland of Eseeola Lodge of Linville asked Troy, who was the sous chef at the Everglades Club, to work for him at Eseeola. For a few years the two lived in Florida in the winter and the High Country in the summer, but as Sandy said, the mountains were a better place to raise their two boys – Matthew and Justin. So they moved to the High Country permanently at about the same time Troy was offered a head-chef position at Elk River Club in Banner Elk in 1990. Five years later, he left to become the executive chef at the Broyhill Inn on the campus of Appalachian State University. Troy led the Broyhill Inn for 10 years before they deciding to buy a restaurant, choosing Mel’s Diner, which was popular with the late, late night crowd, over a few other establishments on the market, in 2005. Since then, the diner has grown a loyal following. That story made Troy and Sandy smile. “If you serve a good product and have good customer service, people are going to keep coming back,” Troy said. To listen to them talk, you can tell they take pride in being a small, independent restaurant in the community among a growing list of chains that have either moved into the area or have announced intentions to set up shop in the High Country. Sandy, in particular, spoke to the theme of local establishments supporting local causes. Over the years, Troy’s 105 Diner has brought groceries for and prepared foods inside the homeless shelter. They have offered gift certificates and proceeds for a variety of fundraisers by sports teams, church groups, nonprofits and youth organizations spanning Ashe, Avery and Watauga counties. “We try to keep everything local,” Sandy said. In addition, Sandy and Troy both praised their employees, some of whom carried over from the Mel’s Diner days, as a trusted and dependable staff. Tammy Nolan, for example, has been a longtime kitchen manager since day one. Pat and Sarah Grant, a husband and wife, breakfast cook and server team, are also longtime employees. Not too mention Wendy Sansbury, Phillip English, Nathan Harris and everyone else who slipped through the cracks. “We’ve got a great staff,” Sandy said. Troy’s 105 Diner only closes two days of the year – Thanksgiving and Christmas. It serves breakfast all day, and it has a menu that would please just about any taste bud with soups, appetizers, salads, quesadillas, platters, vegetarian and gluten-free options, burgers, sandwich baskets, chicken tender baskets, banana splits, milkshakes and did we mention breakfast all day. Take a look at the whole menu here. But you can’t just look at the menu because the specials sound tasty, too. Just last week, specials included chicken ‘n waffles, shepherd’s pie, spaghetti, meatloaf and chicken ‘n dumplings. Some of these dishes were apart of the new “6 for $6” deal – see an image listing that deal below. Troy’s Diner is open 7 a.m. to 9 p.m. Monday through Thursday; 7 a.m. to 10 p.m. Friday and Saturday; and 7 a.m. to 4 p.m. on Sunday. For more information, click here, call 828-265-1344 or stop by the restaurant, located at 286 N.C. 105 in Boone. As its namesake states, Troy’s 105 Diner is located on N.C. 105 in Boone. Troy’s 105 Diner has a loyal following. Some customers wouldn’t know what to do if the joint wasn’t around. Caitlin Nitsche, Sage Norris, Sandy Byrum, Troy Byrum, Phillip English, Matt Dillion, Nate Harris – Staff that happened to be on shift on Thursday afternoon. Customers enjoy a diverse meal at Troy’s 105 Diner on Thursday. The “6 for 6” deal. The joint is decked out in retro memorabilia. Just one piece of memorabilia that lines the walls of the Troy’s 105 Diner. 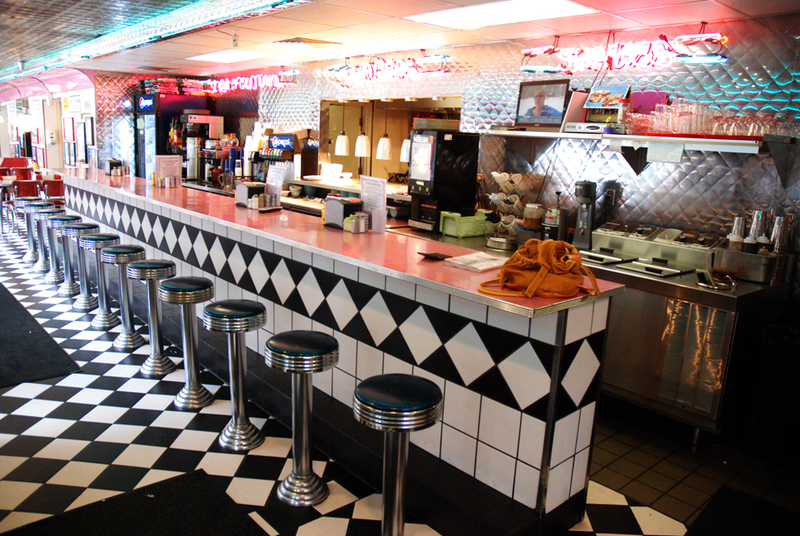 Take a step back into the ’50s with this classic diner. A great place to grab a milkshake or a banana split. Troy’s just added two new banana splits in addition to the traditional split. Sage Norris and Nate Harris cooking in the back. Troy’s caters to locals, students and faculty and tourists on any given day. Nate Harris is about to finish an order.